Since the first Outback Steakhouse opened, our family has expanded to include Carrabba’s Italian Grill, Bonefish Grill, and Fleming’s Prime Steakhouse & Wine Bar. Together, these unique, Founder-inspired restaurants that deliver exceptional quality and welcoming hospitality make up Bloomin’ Brands, Inc.
Today, Bloomin’ Brands is one of the world’s largest casual dining companies with approximately 100,000 Team Members and close to 1,500 restaurants throughout 48 states, Puerto Rico, Guam and 22 countries. Food handler and safety training – Assure all restaurant employees are trained on food safety and handling requirements as required by law. Responsible Vendor (alcohol awareness) – Deliver and report to regulatory agencies on required training for employees who served alcohol. The impact of a restaurant employee not properly trained who served alcohol to an underage person or who served alcohol to a person who was over the legal limit and caused an accident could be potentially devastating to the company. Safety training (OSHA, operational, etc) – Assurance of safety training for regulatory and insurance requirements. HR policy compliance – Delivery and employee acknowledgement of company policies and procedures in accordance with law requirements, EEOC and other employee risks. BBI needed a partner to design and execute the business process and organizational change to a centralized management tool for required training. The solution requirements were robust in functionality to allow their company to expand beyond compliance training into more strategic areas including customer service, menu knowledge, food/beverage sales and leadership development. The solution must allow each restaurant concept to retain its separate personality, branding, identity and proprietary information but also to capitalize on synergies across concepts where possible (e.g. knife sharpening training). This training must consistent, scalable, cost efficient, measurable and reportable. eLogic designed and delivered a hosted application with ten concept portals connected to a single database. 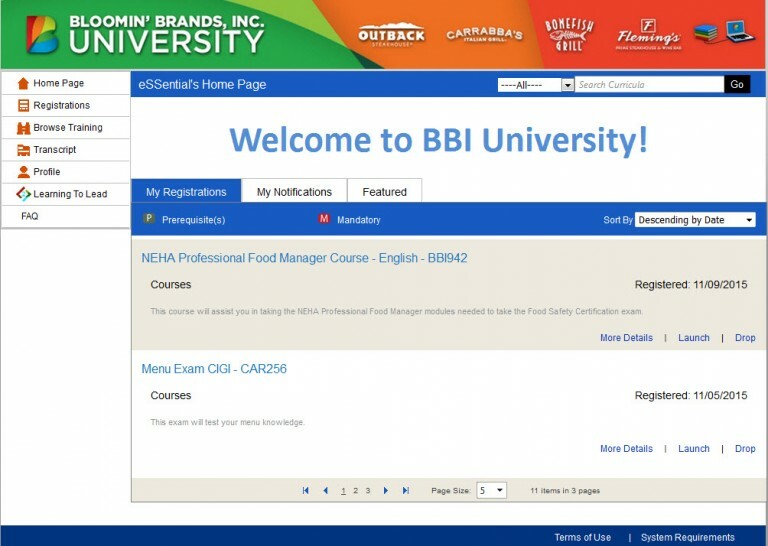 This allows BBI to have separate branding and identity for each of their restaurant chains and employees but manage and administer from a single LMS application. Leveraging the flexible multi-tenant organizational hierarchy within the LMS, BBI is able to assign courses by restaurant chain, geography, job description or other parameter where needed but also at a company level where synergies across the restaurant chains are possible. BBI leveraged the flexible reporting functions within the application to allow each of their 2,000 location managers the ability to report on only their employees in critical areas including industry and regulatory compliance and the company’s training requirements. eLogic integrated with BBI’s HRIS system to provide a “feed” of all employees to the eLogic LMS three times a day ensuring the eLogic databases are current with all new hires, terminations, and other classification changes. This allows employees hired in the morning to be trained in the afternoon before working the evening shift without the need of any manual intervention or involvement by the location manager and determines all mandatory and elective learning plans and paths for all employees. eLogic provided the content strategy for compliance including the above requirements and developed custom content for EEOC requirements, Menu Training and Best Practices. BBI employees completed over 500,000 courses in the first year of using the eLogic eSSential LMS at a fraction of the cost of historical traditional training. The BBI restaurant concepts have the LMS dashboard and reporting tools to ensure 100% compliance with food safety, responsible vendor, safety and other regulatory requirements. Per location greater revenue generation with higher average ticket sales in locations receiving training on new menu items and expense reductions in other areas. BBI has created an industry leading Learning Culture with expansive catalog of e-Learning courses in a variety of subject areas from operations through leadership customer service and greater profitability. BBI saw just shy of 2,000,000 course completions in the past year with an incredibly successful initiative, returning millions in ROI. BBI was exceptionally pleased with the results of the project and eLogic Learning as a company and selected eLogic Learning as a Purveyor of the Year in 2009 and 2010.